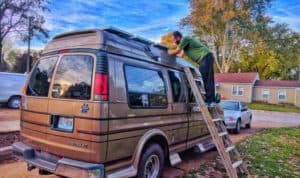 Without water and a way to cook food, vanlife just wouldn’t be possible. Buying food and drinks at restaurants and gas stations all the time is not only unhealthy, it’s also expensive. So, one of the most important parts of any van build is the kitchen setup. Our kitchuation (…kitchen situation…get it?) houses our sink, faucet, foot pump, and water tanks. It also has storage areas for our stove, dishes, utensils, pots and pans. The big countertop gives us plenty of space to prep food, cook, or work, and in its off time it doubles as a structural support for our pullout queen-sized bed frame. And it looks pretty damn sweet, if we do say so ourselves :-). 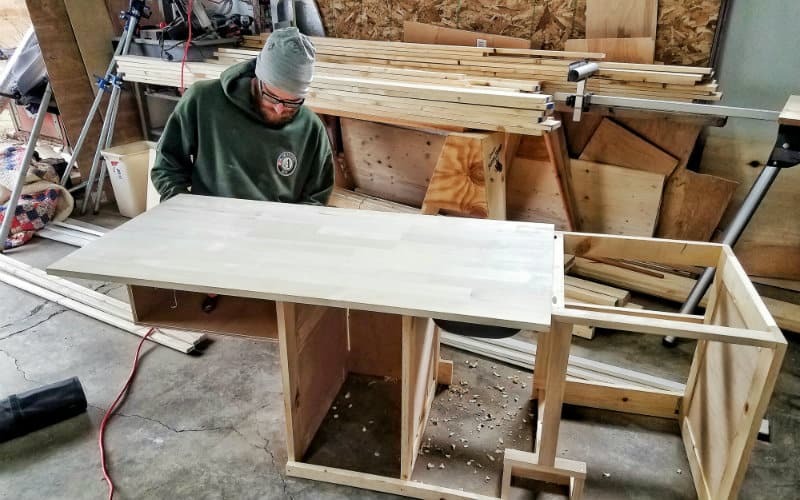 Since our kitchen cabinets are so customized for our particular setup, the specific instructions here may not work for your van without modification. But, we hope you’ll find some inspiration and ideas in how we built and arranged everything. 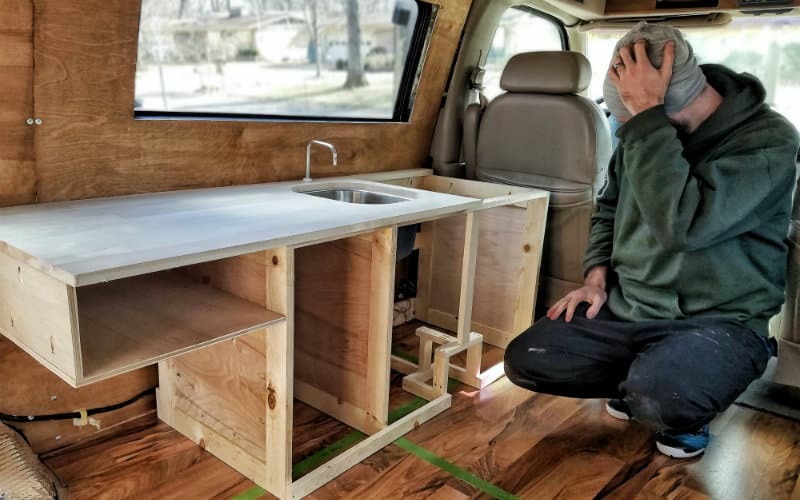 We have plenty of tips and tricks that you can use in designing your own van kitchen. 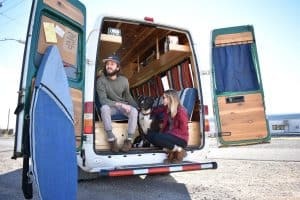 We did several dry runs in which we arranged the items where we thought they should go in the van, and kept rearranging them until we settled on something that made sense. This really helped us optimize the space in our kitchen. 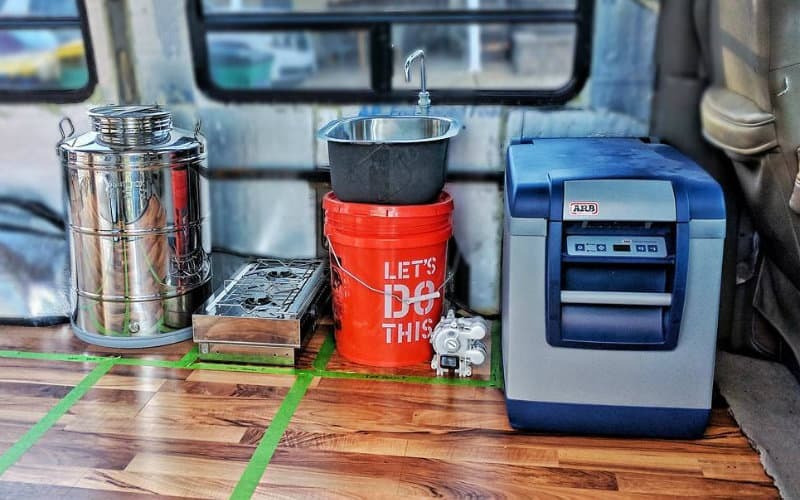 Our original plan was to include our awesome portable 12v refrigerator in the mix and put it under the countertop behind the driver’s seat. But that proved to be a little too cramped for our space, and it left no room for kitchen storage. We wanted to leave this open as a spot for the dogs to lay while we were driving. Getting to the back of the van without going outside would be challenging. 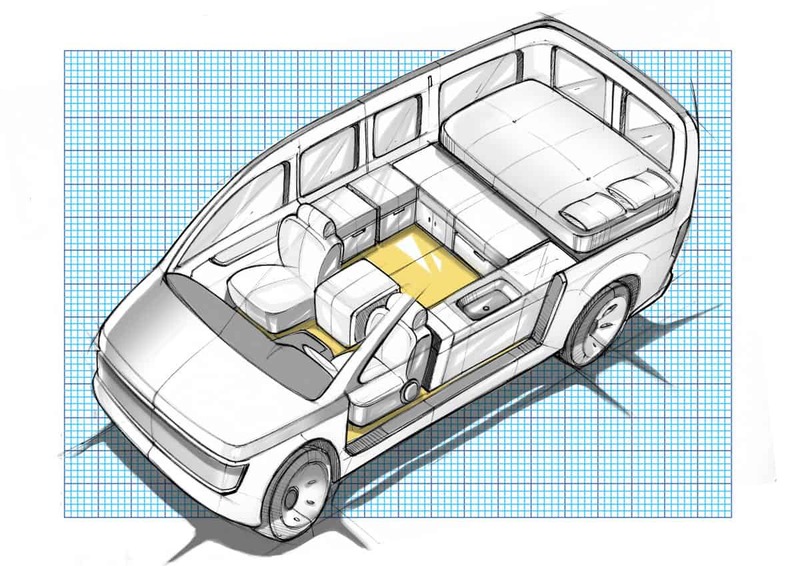 It would pretty much eliminate the option of upgrading to swivel seats down the road. But, it ultimately turned out to be the best spot for the fridge. It just frees up so much space in the kitchen and it makes good use of what would otherwise be dead space. Crawling over the fridge to get to the back isn’t that bad, it gives us another surface to put things on, and it can even serve as an additional seat in a pinch. We also quickly found out that when the dogs are up front, they like to hop up on the dash and look out the window or just mess with us while driving. Nymeria always wants to be in someone’s lap, and Crow wandered down by the driver’s feet a few times hunting for food. Definitely not safe! Once we figured out where we wanted everything, we put painter’s tape down on the van floor to block everything off and give us an idea of the layout so we could design the frame. We decided that the water tank would go right behind the driver’s seat, followed by the sink/faucet/drainage container. Next would be a storage cabinet for our kitchen stuff, then a small cubby to store the stove. This cubby would float over the storage bench, and underneath it would be a gap for a cushion when the bed is in couch mode. 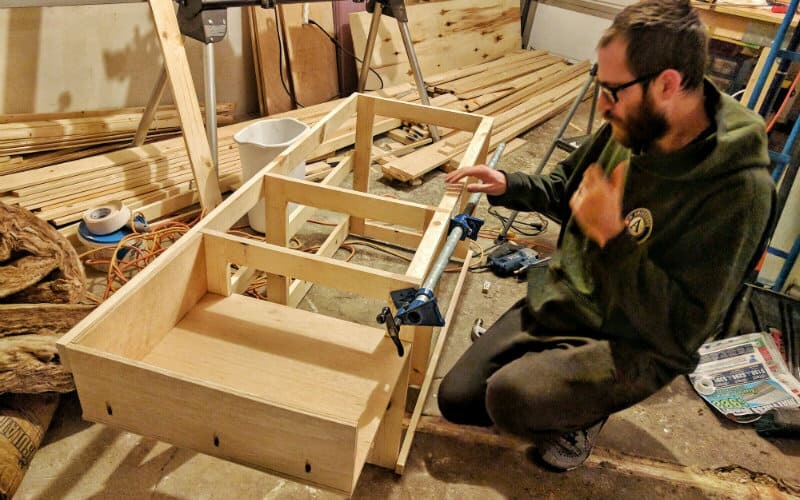 We put a lot of thought not just into how our kitchen would be arranged, but also how it would fit with the storage bench and pullout bed frame as part of a cohesive design for the living area. 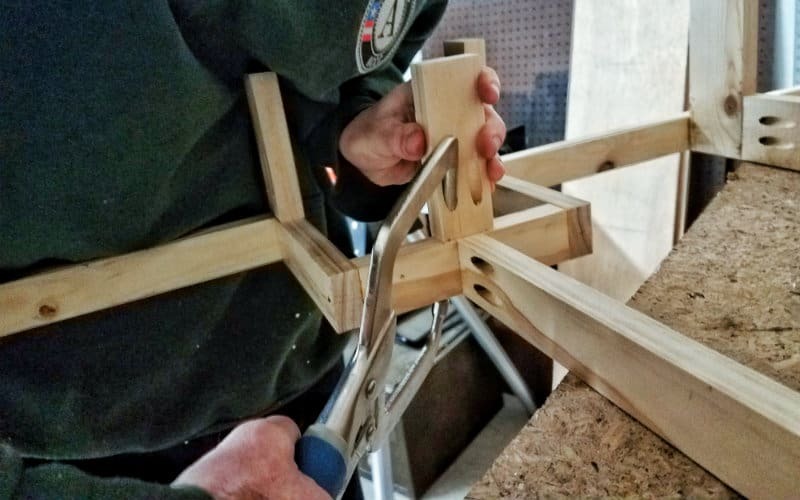 Once we had our measurements, we began constructing the frame out of 1×3’s fastened together with pocket holes. 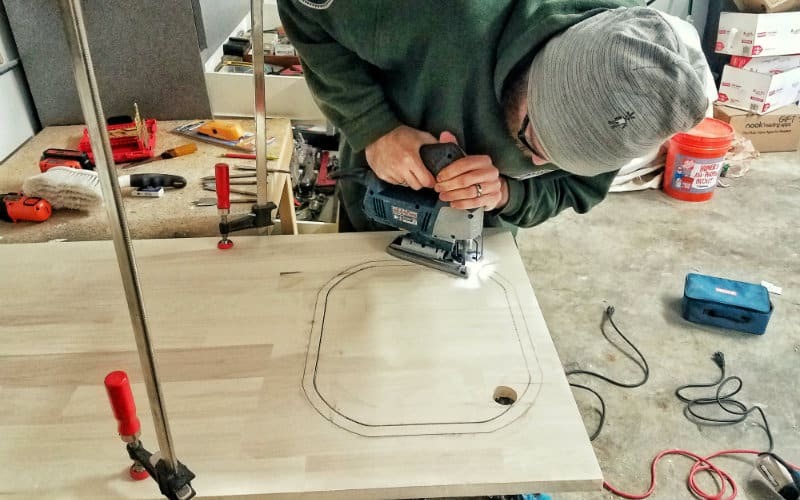 Pocket holes are a way of joining wood together that’s incredibly strong, lightweight, and easy to do. In fact, we wrote an entire blog post about why pocket holes are so awesome. But, they do require a special kit to make them. We first screwed together rectangular frames to separate each section. Then, we attached them into a larger frame by screwing some 1×3 cross pieces across the back. 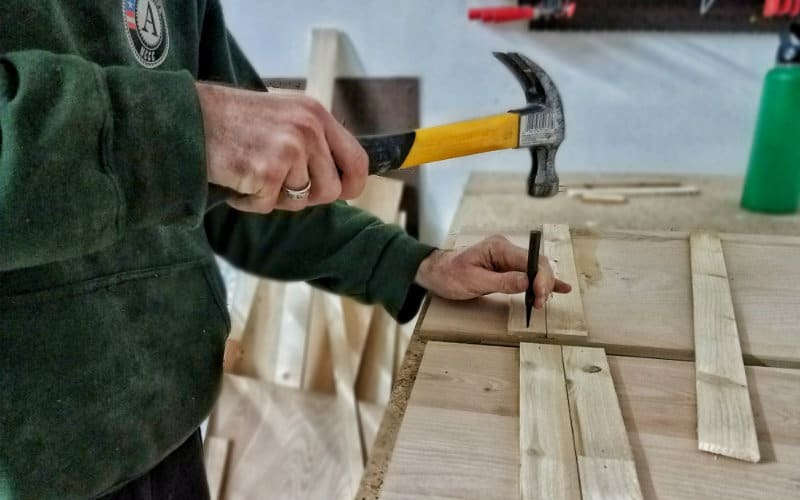 We also attached 1×2 lumber along the front – the pieces along the top help hold the frame together and also add somewhere to screw the countertop to, while the piece at the bottom also helps hold everything together and adds a lip at the bottom of the cabinet. 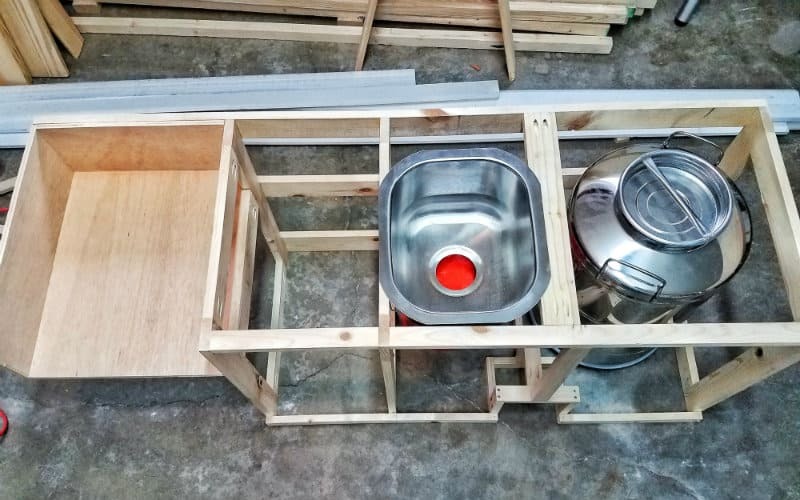 A 1×3 piece separates the sink section from the water tank and gives the sink and water tank lid somewhere to rest. 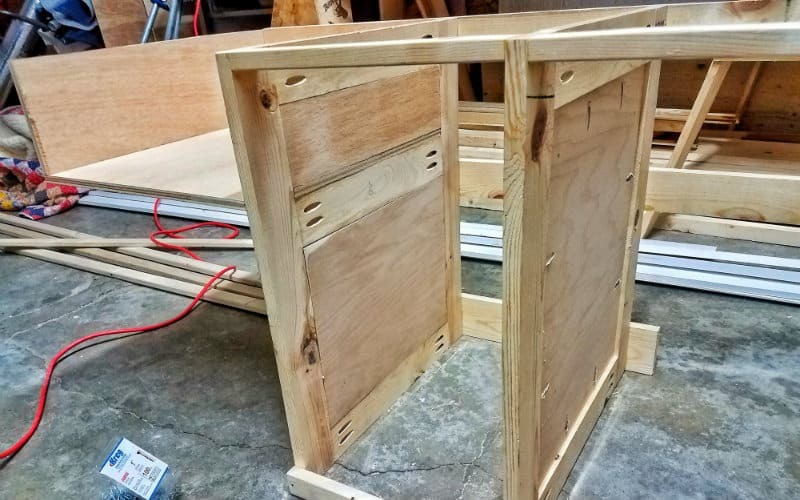 The partial cabinet for the stove is essentially a plywood box screwed together with pocket holes, and attached to the rest of the frame by the rear crosspiece. The bottom of the box is also screwed down to a shelf on the frame next to it. We then cut plywood pieces to make solid walls on the outsides and to wall off the kitchen storage cabinet. 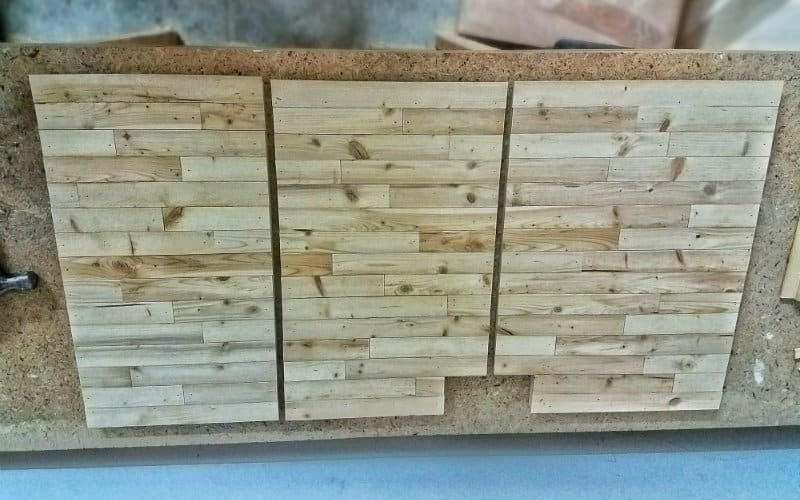 Each plywood piece fits into the gaps in the 1×3 frames, and is attached using pocket holes. The frame also has another important feature: a 6” x 6” x 6” inset for the foot pump made out of 1×2’s and pocket holes. This allows the pump to be flush with the front of the cabinet, but still be easily accessible for pumping water. 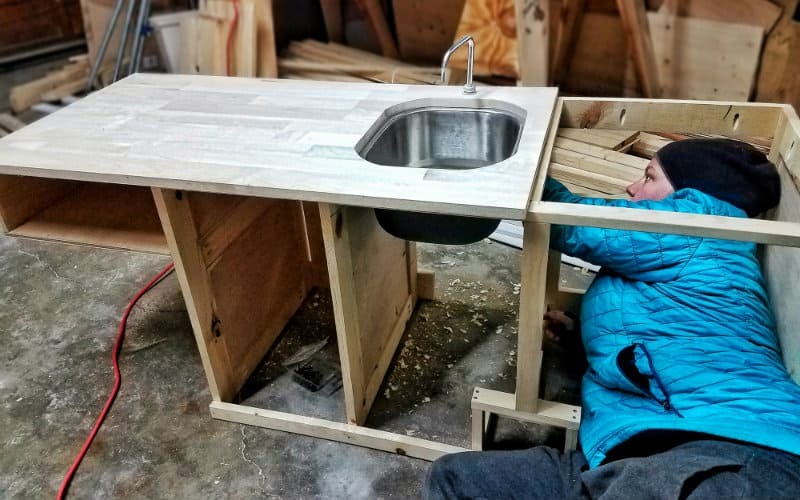 We built the frame so that the sink would rest right on top of it. 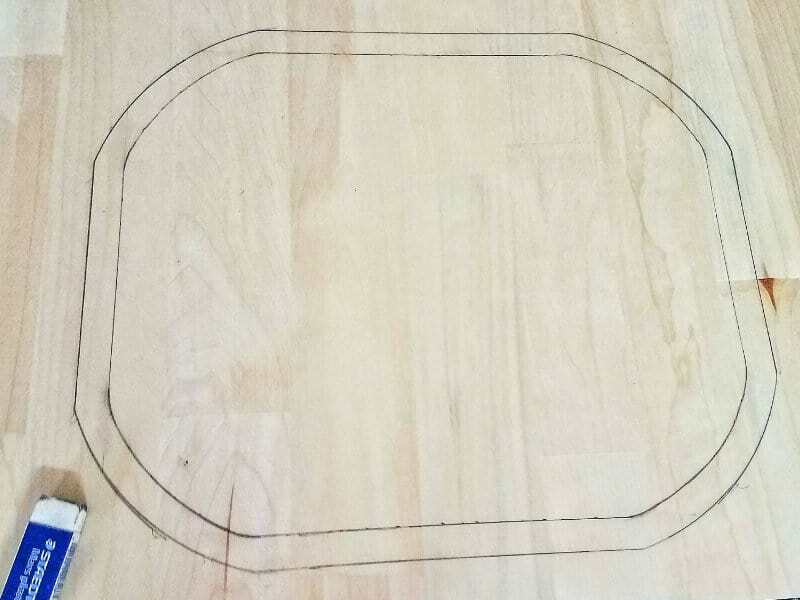 To make sure the countertop would sit flat, we traced where the sink sits and chiseled this out so that the sink lip would be flush with the top of the frame. The counter then could go right on top. 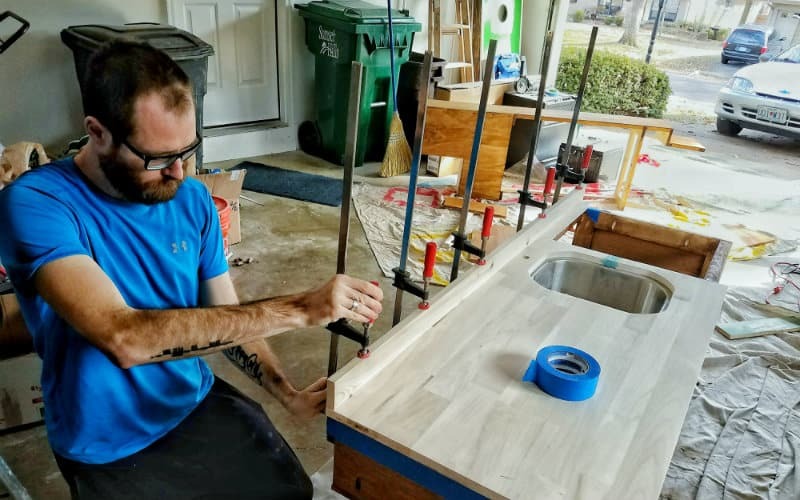 We used a nice piece of edge-glued board for the countertop. The edge-glued piece we used was 24” wide, so the first thing we did was rip cut it to 20”. Then we cut it into two pieces – one for a fixed counter area, the second for a flip up access lid above the water tank. To make the access lid, we rip cut a 2” strip off the edge-glued lid piece that we permanently fixed to the top of the frame. We then attached the lid to this piece using a 12” piano hinge. 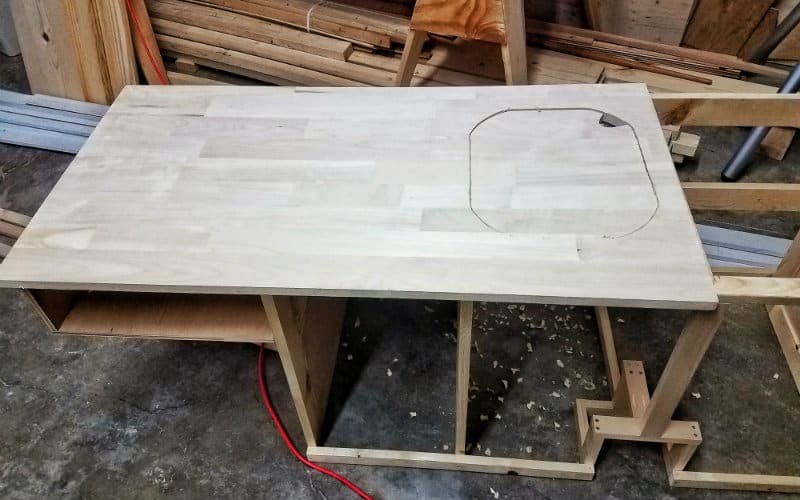 To make the cutout for the sink, we first placed the countertop on the frame and traced as much of the outline of the sink as we could from underneath. We then flipped the counter over, lined up the sink with the pencil lines, and finished tracing. The actual hole needed to be smaller to cover up the lip around the sink, so we drew another line ¾” in from the traced line. We made it so the sink would have about ½” of lip exposed all around. 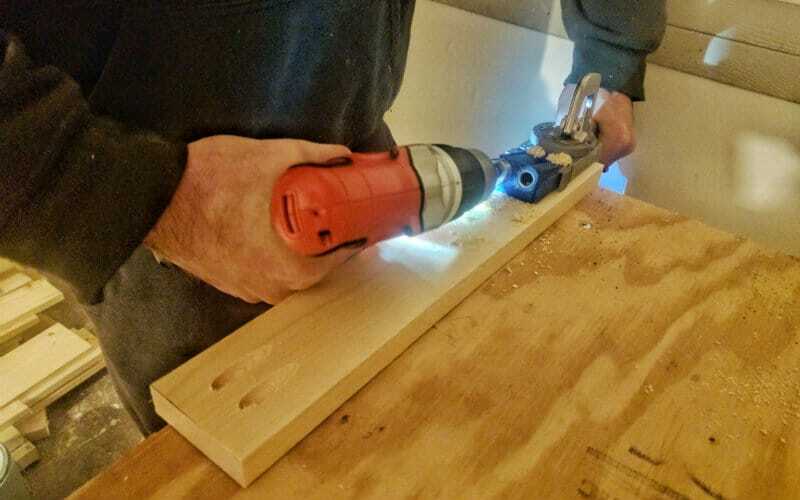 To cut out the hole for the sink, we drilled a hole in the corner with a 1-¼” spade bit, then cut with a jigsaw. The cutout can rest on the exposed lip, and act as a sink cover to give us more counter space when we need it. The hole we drilled with the spade bit lets us easily grab the cover to remove it. We saw sink covers like this when we were scoping out RVs for inspiration and thought it was a great idea. 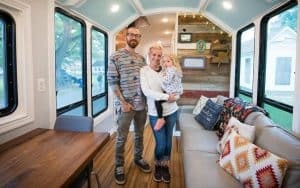 Note: When you’re figuring out the design for your van build, we highly recommend visiting RV dealerships and checking out some of the layouts and other innovations. It can be a goldmine for ideas. After cutting the hole for the sink, we screwed the countertop to the frame using a combination of pocket holes along the top of the 1×3 frame and screws driven up through the 1×2’s along the front. We also drilled a hole behind the sink for the faucet. As with most things in a DIY van build, it’s important to dry fit the cabinets as you go to make sure everything works how you want it to. 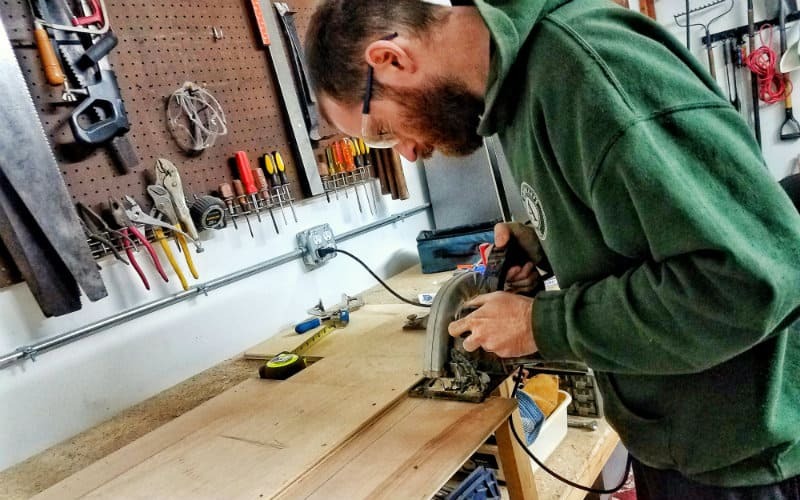 When we dry fit our cabinets, we discovered that we had mis-measured the positioning of the gas tank fill tube, so we had to cut out a piece of the frame to make it work. Oops! To prevent any drippage behind the cabinets and to enhance the look, we added a backsplash made from a really nice-looking 1×3 piece. We cut it to length, then attached it flush to the back of the countertop with pocket holes and Titebond II wood glue. Our cabinet doors are made out of ½” birch plywood, which is very sturdy and also looks great. We cut the plywood to the size of the cabinet openings, leaving some overlap on either side for the doors to rest on the frame when closed. After cutting the cabinet doors, we installed the hardware (hinges and catches) and test fit them on the cabinet frame. We took the hardware off for the next step. While the birch plywood looks good on its own, we wanted to make our cabinet doors look awesome and unique. So we added a rustic facing of mismatched boards to match the style of our cedar plank ceiling. We found a bundle of ¼” pine lath material for about $11 at Menard’s that was perfect. 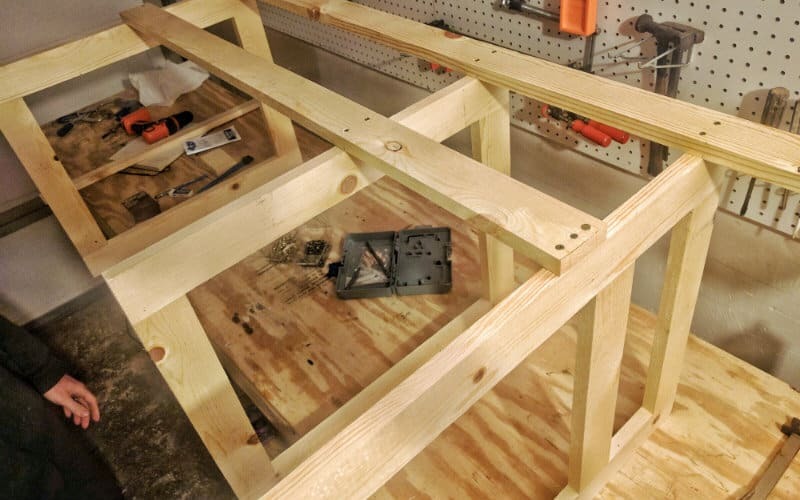 First we laid all the doors side by side in proper order on a workbench. Then we cut and attached the lath one row at a time. We spread Titebond II wood glue on the back of a lath piece, then nailed it down using ⅝” wire brads at either end. We knocked the nails further into the holes using a nail punch. 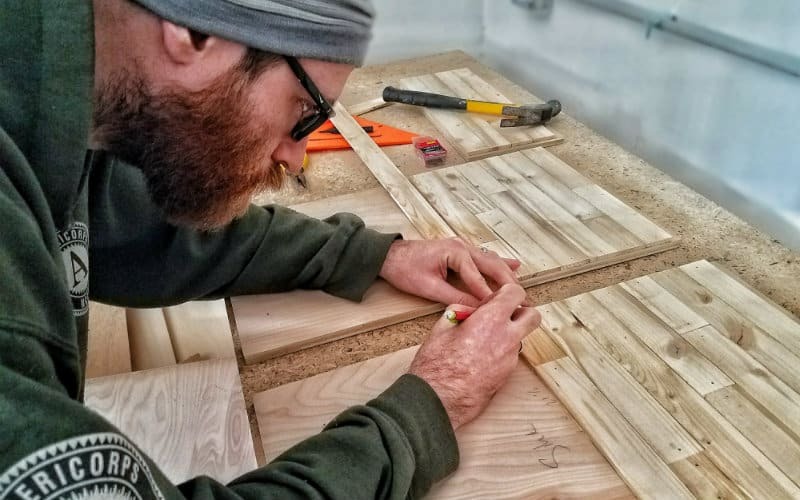 To achieve a mismatched look, we cut the pieces to random lengths – a short board followed by a long board, followed by a medium board, then another short board, etc. We started pieces on one door that we finished on the next door so the grain would be continuous. The final row extended above the top of the cabinet doors, so after installing it we sheared off the excess with a jigsaw. We also had to cut some excess lath away from the opening for the foot pump. Finally, we sanded everything down. 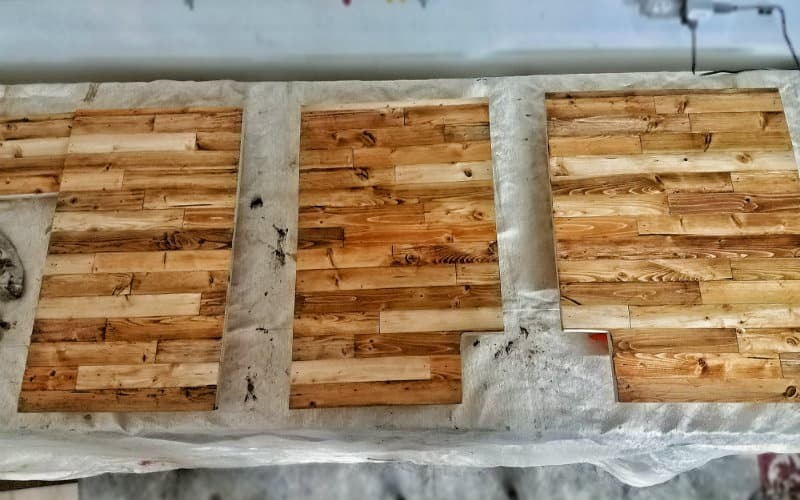 The lath we used had a pretty rough surface, so we started with 50-grit sandpaper, then moved to 80-grit, then 120-grit. This was very time-consuming, but the results were worth it. 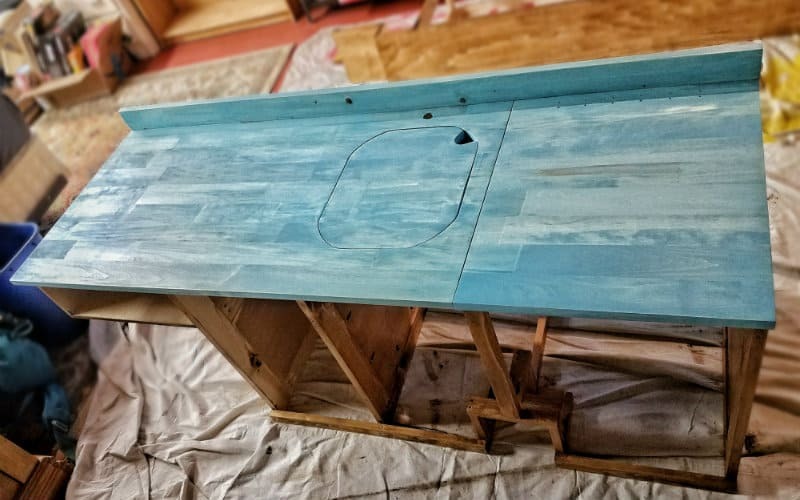 We wanted the cabinet door facing to have the same rustic look as the rest of our van, so we used the same variety of Varathane and General Finishes gel stains that we used to stain our ceiling. Just like with the ceiling, we went board-by-board, wiping on the stain with a rag and trying to randomly mix up the colors. We then used a small paintbrush to fill in the cracks between the boards. 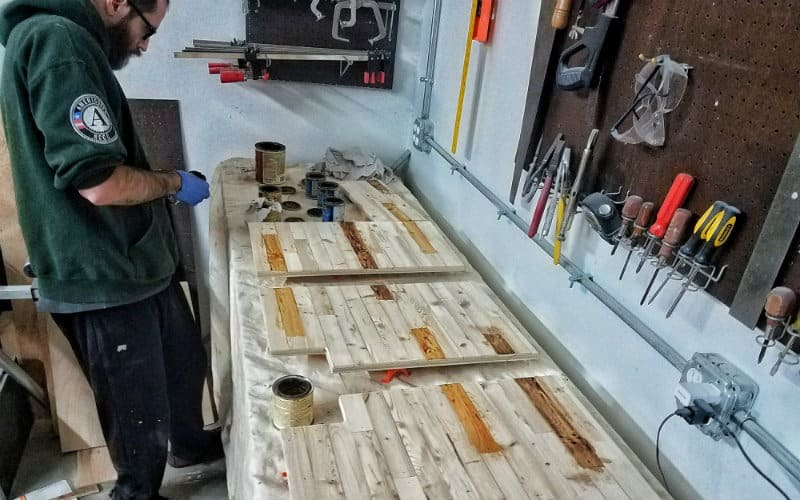 Here’s a video of John in action staining the cabinet door facing. The frame was much simpler. We stained the entire thing with Varathane Provincial. We also stained the sides and backs of the doors with Provincial. We finished the doors and frame with two coats of Minwax Wipe-On Polyurethane. 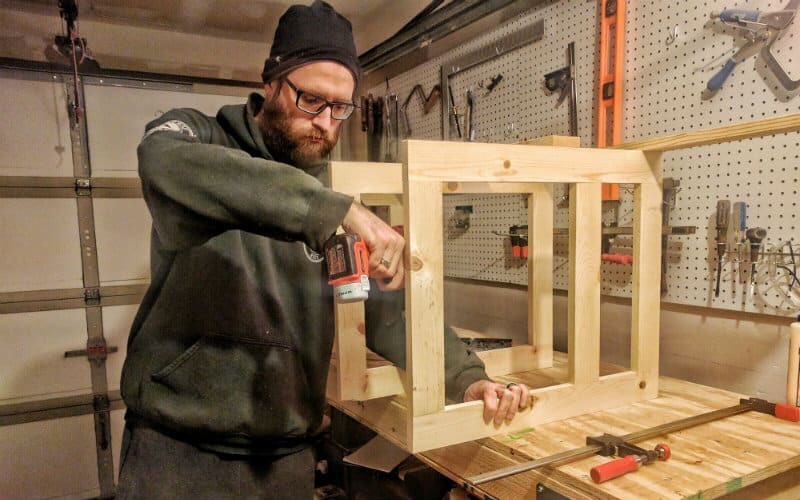 Before staining the frame, we sanded it progressively to 120-grit. We also sanded the countertop down to 180-grit. For the countertop, we wanted it to contrast with the brown tones of the rest of the cabinet but we couldn’t decide on a stain. We tested a light natural stain on a scrap piece, but it didn’t really “grab” us. 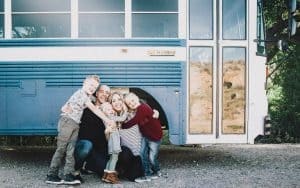 Then we decided to stain it a color – either a blue or a green – to go with the rainbow theme we were planning for the rest of the van. 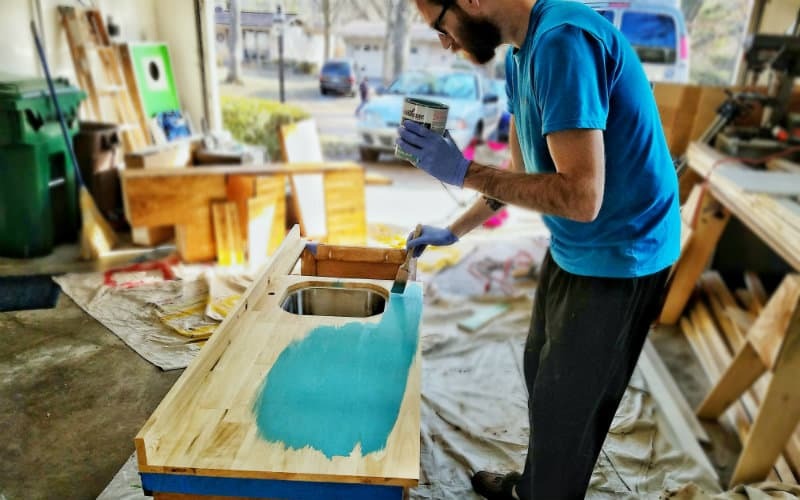 We found an awesome blue stain at Home Depot (Varathane Vintage Aqua) that was perfect – a bright blue that also had kind of a washed look and would let the grain of the wood show through. We brushed on two coats, and it came out perfect. For a finish, we wiped on three coats of Watco Butcher Block Oil. This seals the wood, adds a nice sheen, and is entirely food-safe. After all the staining and finishing was complete, we installed the 12” piano hinge on the water access lid and added all the cabinet door hardware. The cabinet doors got catches, hinges, and pulls, and we also installed sliding window sash locks on the bottom of the main doors and a barrel bolt on the door to the stove alcove to make sure everything stays securely closed while driving. Now that our cabinets were built, we could move on to the final – and most exciting – step: putting them in the van! The way we designed our layout the kitchen cabinet is attached to our fliptop storage bench, so we installed them both at once. 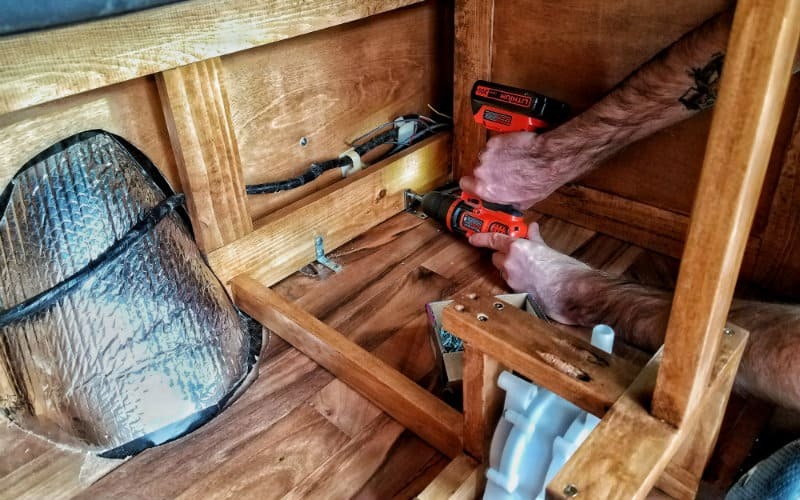 To do this, we moved them into position then anchored them to the van floor using a whole bunch of 1-½” angle brackets and ¾” self-tapping screws. We also screwed the bench and cabinet together where they meet below the stove alcove. These things aren’t going anywhere! 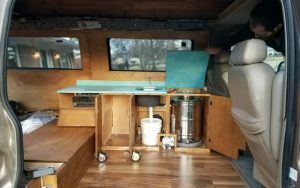 Our van now has an incredibly unique and functional kitchenette. 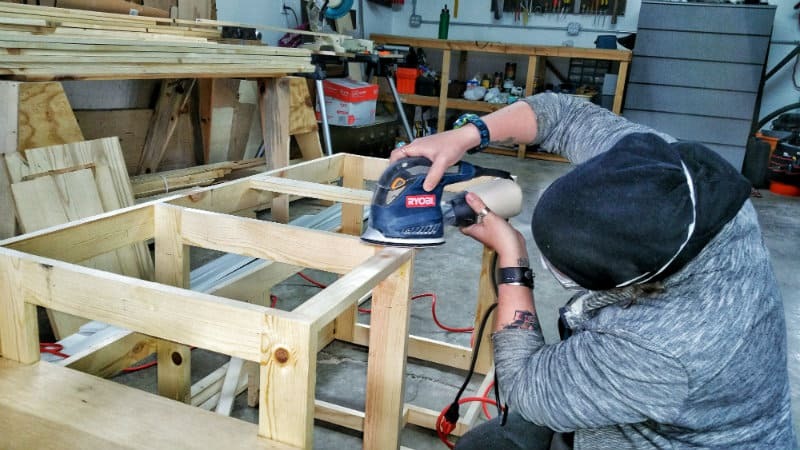 Not only does it hold all of our kitchen stuff and provide a surface to cook and work on – it also serves as a structural support for our bed frame. 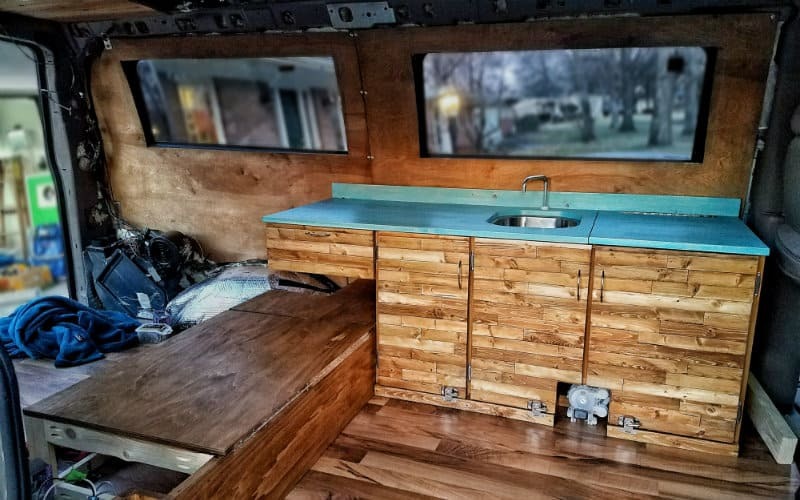 The rustic mismatched facing is one of our van’s defining features, and the blue countertop adds a great pop of color to our brown van interior. There’s a lot to love about our custom van kitchen, and we’ve already cooked many great meals with this setup. We hope our ideas have inspired you to customize your own van kitchen. 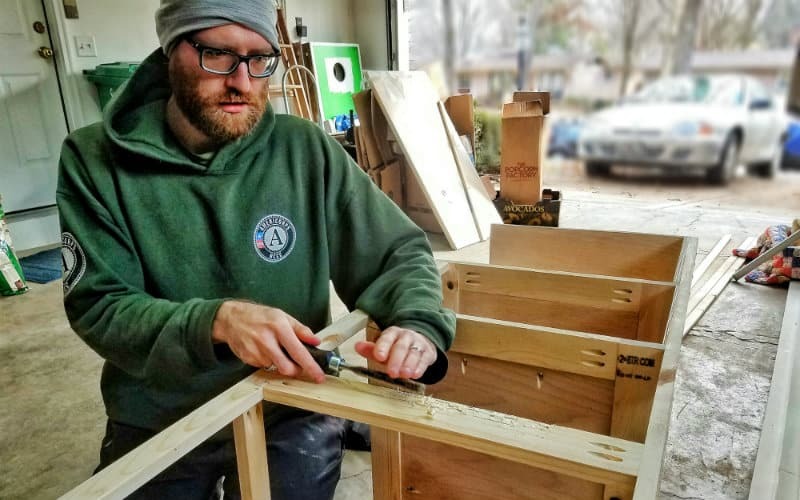 For more build guides, travel updates and vanlife tips, be sure to follow us on Instagram @gnomad_home and on Facebook. Cheers! 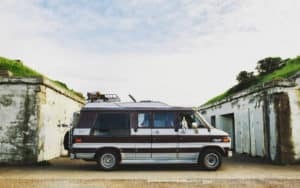 Planning a van build? Read our free guide. We cover just about everything you need to know - from planning, to insulation, to solar and electrical, to picking appliances, to essential tools. Get started today so you can get out there on the road! Hi guys! I was wondering did you use and sort of caulk or sealant between the counter top and the sink? Thanks! Love the stainless steel water container. How do you fill it? Hi Babz, we have a 6-gallon water jug that we fill up at a spigot and pour it into the top of the stainless steel tank. We could also run a hose to it, but we haven’t gotten around to buying a drinking water hose.